Size of this preview: 640 × 435 pixels. Other resolution: 320 × 218 pixels. It depicts the bombardment of the Confederate fortifications on Island Number Ten by Federal gunboats and mortar boats. 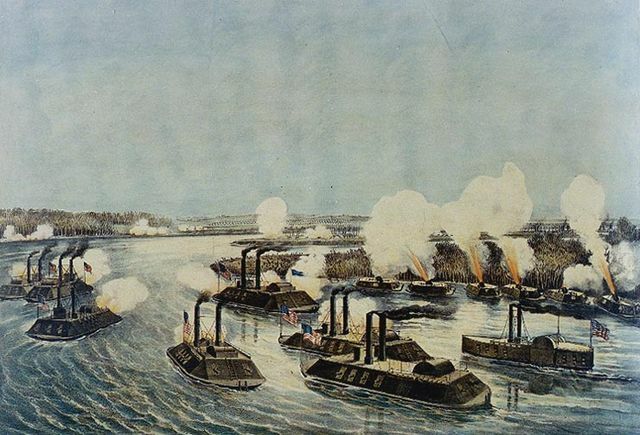 Ships seen include (from left to right): Mound City, Louisville, USS Pittsburg, Carondelet, Flagship Benton, Cincinnati, Saint Louis and Conestoga (timberclad). Mortar boats are firing from along the river bank.